The refugee crisis has been going on for much longer than just a few months but it seems like people are only waking up just now. Horrible pictures on social media and the news and devastating stories are making humanity look really bad. But during these dark times, there were a few moments of light, a few moments of positivity. Here we picked out eight of those moments that restored our faith in humanity a little. Over 10,000 people gathered in different cities in Australia to speak out on the refugee crisis. They want their country to take in more refugees than the number their government has agreed on. A few Australians had a very specific message for Abbott. This one particular picture was shared massively on social media platforms such as Twitter and Facebook. The image shows a father and his family in the most distressing situation. But a few weeks later, a new picture of the family was shown. The family has arrived in Germany safely. At the moment, they are doing very well. On September 1, plenty of German citizens gathered to welcome thousands of refugees who were arriving from Hungary. People had prepared banners, food, drinks and some even had toys for the children. As Sandra Tsiligeridu and a couple of her friends were returning to the island of Kos they saw a man floating in the water. First they thought he was a diver, but soon they realised the man needed help. 28 years old Mohamed had been floating in the water for over 13 hours before Sandra saved him. 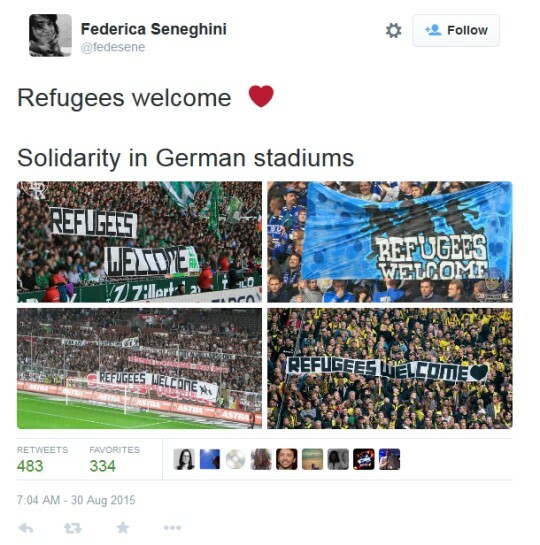 Instead of banners to encourage their favourite team they used banners to let refugees know they are welcome. If you thought that the Ellen selfie at the Golden Globe Awards was phenomenal , you probably haven’t see this one yet. These Syrian refugees took a victory selfie when they arrived at the beach of the Greek island Kos. By running on the field with a large banner, FC ST-Pauli and Borussia Dortmund showed refugees that they are more than welcome. Superman who? This man, Antonis Deligiorgis, dove into the water and saved over 20 refugees that were floating around after their boat hit the rocks on the coast of Rhodes. Greece is helping muslims despite all Islamic attacks by Arabs and Turks in the past that made Greece suffer. Muslim world owes an apology to Greece. Greeks just showed to muslims how real humans must behave even towards past enemies, who tried to enslave them and made them refugees.